Happy Mother’s Day! Unfortunately I don’t live near my mother and I work on Sundays, but I’m excited to see her tomorrow and take her out for the day. Although in reality, I think every day should be Mother’s Day, because my mom is awesome and I hope she knows that! 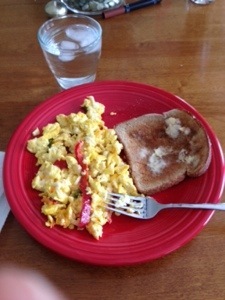 Since I wasn’t there for the family breakfast, I made myself an egg breakfast at home. Eggs are a perfect way to start your day, since all the protein will keep you full and you can add plenty of veggies for more health benefit. Hope everyone enjoys this lovely Sunday! Heat olive oil on a skillet at medium high heat and add veggies, cook until tender. Lower heat to medium and add eggs; scramble with the veggies until cooked. Top with cheese and mix, then remove from heat. Add a piece of toast with butter and a piece of fruit and you’ve got a balanced, filling breakfast! Thank you honey. Your mom loves you!! !